MASON MACHINE & TOOL does prototype and short run machining of complex parts. Using conventional and CNC equipment, we make parts in very small quantities for companies that need to validate new designs before bringing products to market. More often than not, quick turn around is imperative. Our fast deliveries help our customers meet their schedules and keep development plans on track. At MASON MACHINE & TOOL, we take tremendous pride in our work. We scrutinize the details of every job and often catch engineering errors before any machining is done. This attention to detail frequently prevents costly rework and delays, which can save your company a lot of unnecessary expense. Additive rapid prototyping methods are not a good fit for many prototype parts, often because of finish specifications or required material characteristics. MASON MACHINE & TOOL does prototype and short run machining on certified plastics, brass, aluminum, carbon steel, stainless steel or tool steel. 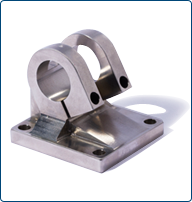 With our extensive experience, we can produce fine finishes and hold close tolerances to satisfy many of your toughest requirements.